I had a recipe something like this years ago, off a packet of duck breast — now lost, but this is more or less a re-creation of it. Delicious and easy. I used PX sherry, but use whatever sweet wine you fancy — port or madeira would work too. Serve with something to mop up the sauce: mashed potato, rice, or just good bread. This amount serves two (we never eat a whole magret each). Made up by Steve on the spur of the moment based on what was in the fridge and pantry. Definitely worth repeating; it was delicious. It’s the caramelised onions that raise it above the ordinary, so give yourself plenty of time to get them well coloured. It’s called forestière because of the combination of artichokes and mushrooms. Adapted from a recipe in the Slimming World magazine — a useful source of low-calorie recipes that don’t compromise on flavour. I cooked my lentils from scratch, but if you’re lazy or in a hurry, you can use a can. A very easy midweek dinner. Based on a recipe from BBC Good Food; adapted to make it a bit more Slimming World friendly (OK, pastry will never be syn-free, but the rest of it almost is). It may sound fairly ordinary, but it was really delicious and well worth repeating — it’s the mustard that really makes it shine. If you’re not on a diet you can use crème fraîche instead of quark, but we found the quark worked really well; the flour in the sauce stops it curdling. The original recipe specified puff pastry, but we just used home-made shortcrust and it was fine. In fact thinking about it, you could maybe use a few layers of filo pastry on top to reduce fat further. It’s best to make the filling ahead of time and let it cool before adding the pastry. This is a Lucy Bee recipe from a magazine. Described as “traditional Spanish”, it features coconut oil. But I guess that’s because it’s from a book called Coconut Oil: Recipes for Real Life. So naturally we substituted more authentic olive oil. Effort versus results score: excellent. It was really delicious, and a great one-pot meal for cold weather. When we’d eaten all the chicken and veg there was quite a lot of spicy sauce left over, so we had it with pasta later in the week, and it was worth having leftovers just for that. Definitely a keeper. When S cooks, he tends to look at recipes for inspiration, then put them aside and make something up. This started as a lamb and onion tagine with honey, but ended up bearing little resemblance to the original. It was delicious though. As well as the ingredients listed he added some cubes of roasted butternut squash right at the end, but this was only because we happened to have some; it can easily be left out. I was given Provence, 1970 for Christmas and have just been reading it. In it, a group of well-off Americans, all interested in food, gather in Provence in autumn 1970, cook, dine, and have endless conversations about food and wine. They just happen to include Julia Child and her husband Paul, M.F.K. Fisher, James Beard, and Richard Olney. I enjoyed it in a cosy sort of way, eavesdropping on their gossip and occasional snobbery. The author, Luke Barr, is MFK’s great-nephew, and he used letters and especially his great-aunt’s notebooks and diaries, to reconstruct whole evenings of conversation in a convincing way. 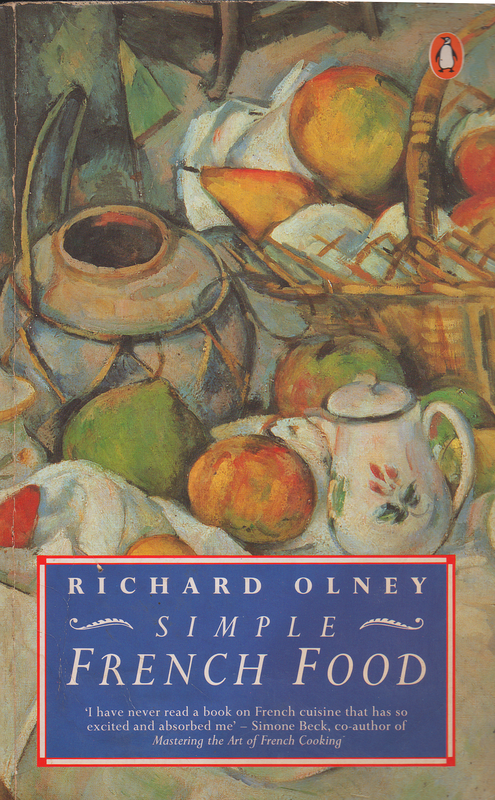 I have to say that I wasn’t surprised to find that Olney, while probably the best cook of the lot of them, could be a somewhat unpleasant character — his Simple French Food is written in such a way that I never felt I’d be comfortable in the kitchen with him, just as I wouldn’t be with Elizabeth David. Whereas Jane Grigson, MFK, or Julia Child would surely be good company. It was a bit disappointing to find that Sybille Bedford (partner of an old friend of MFK’s) could be rather obnoxious as well though. Serendipitously, we were looking for a recipe for stuffed cabbage and found one in Olney’s book. Oh, good, a chance to revive my neglected cookbooks theme! I’ve had this book for many years and even blogged a recipe from it once, but I don’t get it out often. There’s no denying the quality of the recipes; it’s the turgid prose that puts me off. The first sentence sets the tone: it’s 124 words long. He’s the kind of person who refers to himself as “one”, and his paragraphs are unnecessarily long and rambling. Still, the proof of the pudding and all that. Alice Waters quotes him as her main inspiration for Chez Panisse, and by and large I’ve been happy with the results of the recipes I’ve tried. He has taken traditional French bourgeois cooking and turned it into an art form. I have to say that while stuffed cabbage may sound dull, if not positively offputting, it was spectacularly good. So if you’re a fan of traditional French cooking and you can get past the convolutions of his prose style, it’s worth having on your shelf. But if you’re not an experienced cook, I still believe no-one surpasses Mireille Johnston for authenticity and accessibility. Mireille’s is the book that’s splattered with food stains in our house. Such a shame it’s out of print; on the other hand it does mean you can obtain cheap second-hand copies. Anyway, here’s the stuffed cabbage. We made this with pork mince from organic, free-range pigs browsing under oaks in the Aragonese Pyrenees, which probably had a lot to do with the excellent flavour. We didn’t have much stock, so we just made it up with water and flavoured it with a whole peeled onion and a couple of carrots. You need a piece of muslin or a string bag to wrap the cabbage in, and some string. This is one of those delightfully easy “stick it in the oven and forget about it” supper dishes. Other than green veg or salad, you won’t need anything with it, and even drab supermarket chicken will be suitably perked up. It’s from a Sainsbury’s magazine, slightly adapted by me: the original called for halved new potatoes, but it seemed entirely implausible to me that they would cook from raw in the oven in 45 minutes. So I cut my (non-new) potatoes into 2-cm chunks, and they were just barely cooked in an hour. If you do want to use larger pieces, you’d be well advised to parboil them for about 3 minutes first, but this makes a bit more work. I cooked this in two gratin dishes; it will serve about six. From a cheffy recipe printed in the local paper, but heavily adapted to make it more practical. The original used a boned saddle of lamb — we replaced that recherché idea with a thick slice of leg, which worked very well for the two of us. Basically you need a lean, fairly thick piece of meat. We also cooked the garlic for longer, to make it soft enough to squeeze out of the skins. A vexed question. This one was so overgrown it qualified as a marrow. We’d already done the standard stuffed marrow with half of it, and still had enough left for another meal. A bit of googling turned up something called “savoury marrow bake” at AllRecipes. I glanced at it half-heartedly and then realised it wasn’t stuffed marrow but a kind of frittata/crustless quiche for which we had all the ingredients. So we took the idea and ran with it, changing quantities to make a lighter, more slimmer-friendly dish. Of course you could add or substitute other veg if you wanted. We were very pleasantly surprised by the result. The flour and baking powder give it a smooth yet light texture quite different from frittata. You can eat it warm or cold; we had it with a tomato sauce, but chilli jam would be excellent too. Good picnic or buffet fare, cut into small squares. Or use it as a side dish with anything that has a sauce. Definitely a keeper. Now I just need to think of a name for it.